The American Ballet Theatre is one of the greatest classic ballet dance companies in the world. PROBLEM: To acquire new members and renew expired ones. PROCESS: We began the project our usual way: by looking at past fundraising efforts and then determining what is most relevant at the time of the mailing. With ABT we came to several conclusions. First, looking at the past letters we knew they could be strengthened by including copy about how a person’s membership supports the dancers, in addition to providing details about the wonderful donor benefits. Second, in speaking to others outside ABT, we noticed a lot of excitement around the art and costume designs for the new ballet production of Whipped Cream. We wanted to incorporate that excitement into our mailing — and we did that by coming up with a unique freemium: a greeting card featuring art that was created especially for the new ballet production by Mark Ryden, a pop surrealist with a singular style. Including this buzz-worthy freemium in the package allowed us to do more than say Free Gift on the outer, which almost guarantees it will be opened. We think it will also pique interest in going to the ballet and encourage more signups. 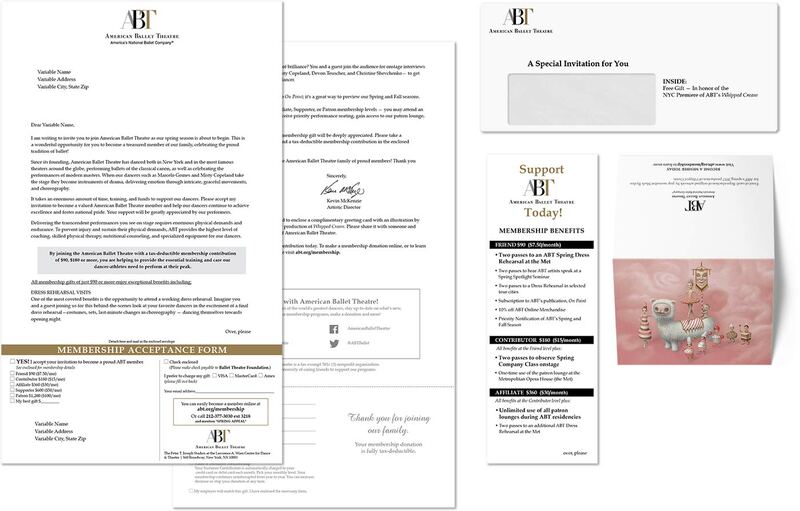 Plus, if the card is passed along, it just might get the recipient excited about ABT, too! RESULTS: This promotion was a big winner — 50% increase in memberships, compared to their previous creative!